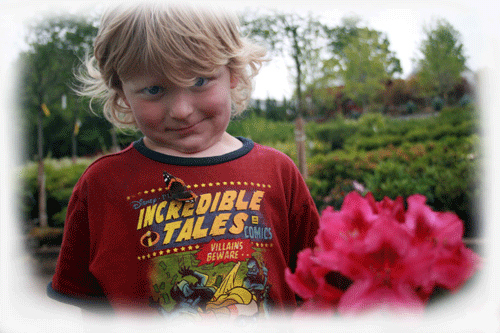 HUDSON, NH – Countrybrook Farms Nursery & Garden Center opened in April of 1997. 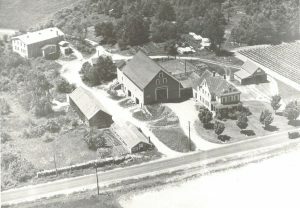 Located at 175 Lowell Road in Hudson, NH the property had been known for decades by most locals as Kashulines Farm. Acquired by the Kashulines family in 1906, the property consisting of over 200 hundred acres, was primarily a dairy operation through the mid-fifties. In the early sixties, the land that sprawled from the house and barn to the shores of the Merrimack river and south to Green Meadow Golf Course, was used to grow produce. This marked the beginning of what many locals remember as Kashulines Farm Stand. In the mid-seventies development saw most of the land sold off which today is the Executive Drive Industrial Park. The farm stand remained in operation until the mid-nineties while the barn and the remaining acreage were used mostly for storage and dumping. Countrybrook Farms, consists of the house originally built in 1765, the barn built in 1846 and the remaining 7.5 acre piece of property. When Countrybrook Farms took over the property in 1997, the roadside farm stand was destroyed at the towns request, while additional parking was added to the front of the barn. The last bit of remaining farmland behind the barn was cleared of a tractor trailers worth of old tires and other debris. Owners Michelle & Jay Shattuck recall the hours of “sweat equity” put in those first couple of years. “We weren’t able to occupy the barn our first year open, so our garden center was a 20’x 20’ garage next to this big charming barn,” recalls Michelle. Imagine generations of junk accumulating on the remaining acreage left behind for the next owners to deal with. “That was us!” chimes Jay. “We spent countless hours cleaning up, renovating and refurbishing this special piece of property.” “It was wonderful when we finished the renovations to the barn,” remarks Michelle. “It’s such a beautiful building to house a garden center and gift shop in and we think it is really neat that it allows us to share a local landmark with the community. Everything we do to the property for improvements is always mindful of maintaining as much of the original charm as possible.” “It’s fun to hear our customers talk about their childhood experiences fishing or skating on the pond in our backyard or old-timers commenting on how good the pheasant hunting used to be back there when they were young,” adds Jay. Today, the barn at Countrybrook Farms has something to offer everyone. The main level is devoted to garden décor, garden gifts & accessories, as well as country home décor, gourmet foods, candles, old fashioned candies, gift baskets, floral arrangements and floral wreaths galore. For the serious gardener there’s plenty of tools, seeds, landscaping supplies, garden clogs and the like. The loft in the barn is sure to bring “sugar plums dancing in your head” as it has been dubbed “The Christmas Loft.” Now you will find Christmas on display all year. Silk trees decorated to the hilt, unique country ornaments, wreaths and gifts are sure to inspire. The basement level of the barn houses “The Pro Shop.” This area has been devoted to landscape contractors only. This separate checkout area has everything from hydro-seeding supplies, bulk grass seed and fertilizer, to contractor grade tools, gloves, and tarps. Why the separate checkout for landscaping contractors? “We realize that time is money for these guys, so we are trying to expedite their checkout so they can get back to work,” says Jay. But what about the serious homeowner who takes care of his own lawn and garden? Countrybrook Farms has turned the building next to their barn into the “Earth & Turf Supply.” Here the homeowner will find a complete line of Jonathan Green turf products, Espoma, and Fertilome plant and garden products, grass seed, fertilizer, weed fabrics and more. Got a lawn problem or landscaping project? We can help. Those who drive by Countybrook Farms on a regular basis can’t help notice an abundance of seasonal color throughout the front of the barn. “We stock only the finest quality annuals and perennials and whenever possible we try to use local growers,” explains Michelle. “What people don’t always realize is the magnitude of the area located behind the barn. With over four acres devoted to trees and shrubs of all sizes, bark mulch, soils, and more, there is something for everyone.” “We choose our growers very carefully. We travel all over the country visiting suppliers to assure the highest quality plant material at the very best value for our customers,” remarks Jay. What else you ask? “We are trying to expand our offerings in the category of outdoor living,” explains Michelle. “People establish areas of their yard, much like they would decorate their living room.” With this in mind Countrybrook Farms is expanding into patio furniture, water features, outdoor fireplaces, trellises, arbors and more. We computerized our check-out areas. We will continue to enhance this addition by building our database to provide our customers with purchase histories, newsletters and better overall customer service. We have added landscape design imaging to our overall design consultation service. Countrybrook Farms landscape designers can scan a picture of your site into our computers and paste pictures of plant material, walkways, walls, etc. This is a wonderful tool for actually seeing what your property will look like for project completion or in a years time. The program should really put the homeowner at ease and simplify the decision making process. We are proud to offer Blake’s Creamery premium ice cream right out of our very own CountryBrook Cafe. ice cream stand at the garden center in NHBlake’s Creamery has been producing quality dairy products for over 100 years. Their ice cream is made in small batches using an abundance of the purest, highest quality ingredients available, combined with over 30 flavors to choose from. We offer not only ice cream but also sandwiches, wraps, coffee and freshly baked goods by Busy Mom’s Bakery. 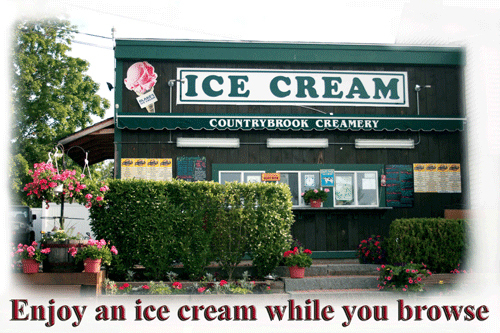 We think Countrybrook Creamery will provide families with a neat destination on those hot summer days and nights. 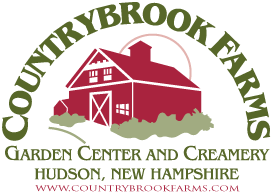 Welcome to Countrybrook Farms Nursery & Garden Center in Hudson, NH. Our Garden Center is located on 8 acres, offering extensive selections of trees, shrubs, annuals, perennials and so much more. You can’t miss our charming 2-story gift shop barn in the center of the property. Our front yard area is filled with seasonal annuals, perennials, water fountains, benches, arbors, birdbaths, water gardening plants, greenhouse, pottery, garden decor, ice cream stand, custom sheds, New England lawn & garden supplies and much more. We cater to the homeowner and landscaping contractor alike. Our knowledge of NH and the New England area and the specific horticulture needs of your gardens, trees, shrubs, and perennials during each season, make us an excellent reference source for your gardening, landscaping projects and horticulture questions. Take a look at our Tree & Shrub Price List Page, which is an Excel sheet listing the many different tree and shrub varieties, sizes, pricing and other helpful horticulture information. Print out pictures of your potential landscape project and we’ll be happy to help you with your landscaping ideas. We can help you select the right plants for the right place based on your personal taste, the plants proportions, growing requirements and horticulture information. We’ve been working hard to become the very best garden center in NH. Our Big News! Countrybrook Farms was chosen as one of the Top 100 Revolutionary Garden Centers in the entire USA by Today’s Garden Center Magazine! The complete list of the 2008 Revolutionary Garden Centers Awards appears in the January issue of Today’s Garden Center Magazine. For over ten years we’ve been serving the Hudson NH, and Nashua NH area communities including: Amherst NH, Atkinson NH, Bedford NH, Brookline NH, Concord NH, Derry NH, Dover NH, Dublin NH, Deerfield NH, Epping NH, Epsom NH, Exeter NH, Francestown NH, Goffstown NH, Greenfield NH, Greenville NH, Hampton NH, Hanover NH, Henniker NH, Hillsboro NH, Hollis NH, Hookset NH, Keene NH, Litchfield NH, Londonderry NH, Loudon NH, Lyndeborough NH, Manchester NH, Merrimack NH, Milford NH, Mont Vernon NH, New Boston NH, Pelham NH, Peterborough NH, Raymond NH, Rochester NH, Rye NH, Salem NH, Tilton NH, Weare NH, Wilton NH, Windham NH, as well as Massachusetts and many throughout the entire New England area.